Shashank Singh, M. Pharm, Ph.D. The endophytic fungus strain MRCJ-326, isolated from Allium schoenoprasum, which is also known as Snow Mountain Garlic or Kashmiri garlic, was identified as Penicillium pinophilum on the basis of morphological characteristics and internal transcribed spacer region nucleotide sequence analysis. The endophytic fungus extract was subjected to 2D-SEPBOX bioactivity-guided fractionation and purification. 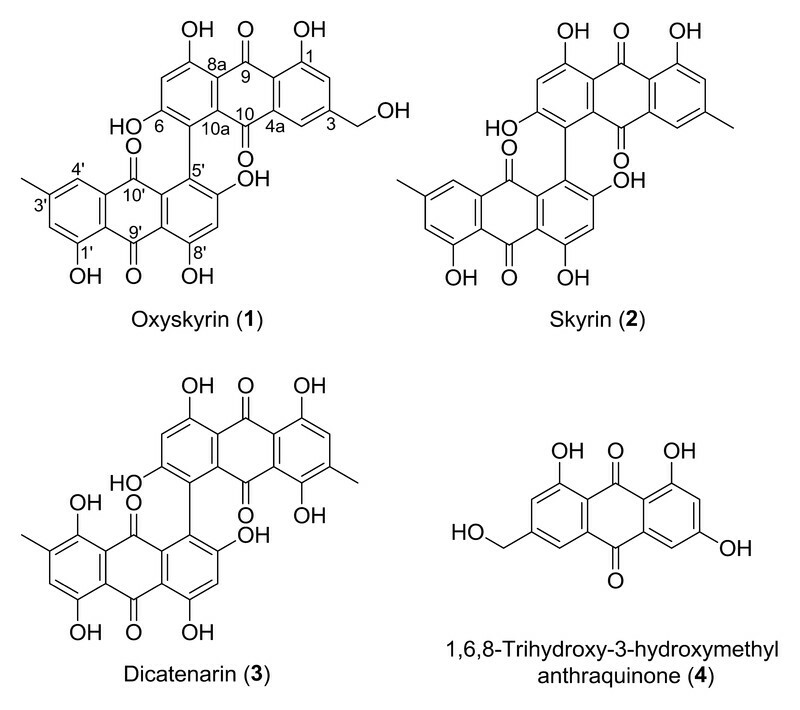 The anthraquinone class of the bioactive secondary metabolites were isolated and characterized as oxyskyrin (1), skyrin (2), dicatenarin (3), and 1,6,8-trihydroxy-3-hydroxy methylanthraquinone (4) by spectral analysis. Dicatenarin and skyrin showed marked growth inhibition against the NCI60/ATCC panel of human cancer cell lines with least IC50 values of 12 µg/mL and 27 µg/mL, respectively, against the human pancreatic cancer (MIA PaCa-2) cell line. The phenolic hydroxyl group in anthraquinones plays a crucial role in the oxidative process and bioactivity. Mechanistically, these compounds, i.e., dicatenarin and skyrin, significantly induce apoptosis and transmit the apoptotic signal via intracellular reactive oxygen species generation, thereby inducing a change in the mitochondrial transmembrane potential and induction of the mitochondrial-mediated apoptotic pathway. Our data indicated that dicatenarin and skyrin induce reactive oxygen species-mediated mitochondrial permeability transition and resulted in an increased induction of caspase-3 apoptotic proteins in human pancreatic cancer (MIA PaCa-2) cells. Dicatenarin showed a more pronounced cytotoxic/proapopotic effect than skyrin due to the presence of an additional phenolic hydroxyl group at C-4, which increases oxidative reactive oxygen species generation. This is the first report from P. pinophilum secreating these cytotoxic/proapoptotic secondary metabolites. Natural products have been exploited world over in hope of finding new pharmaceuticals. Development of the pharmaceutical industry has stimulated the search for novel natural products from diverse environments and organisms. In this context, secondary metabolites of microbial origin deserve special consideration. Microorganisms are able to produce a variety of secondary metabolites including cytotoxic and antiproliferative compounds, which are valuable in cancer drug discovery. Particularly, natural products from endophytic fungi have been the mainstay as a source for novel anticancer agents over decades . Among all fungal generaʼs, Penicillium, undoubtedly, is one of the most scientifically exploited and is widespread both in terms of environment and geography. Substantial work has been carried out worldwide with regard to endophytism in Penicillium aimed at the characterization of secondary metabolites and their biological potentials. This has enhanced our knowledge and created opportunities for its pharmaceutical exploitation, along the lines of a historical tradition of drugs derived from Penicillium strains which started with the discovery of mycophenolic acid  and continued with the wonder drugs penicillin  and compactin . Endophytic Penicillia produces diverse secondary metabolites including, alkaloids, chromones, depsidones, diterpenes, ergochromes, esters, flavonoids, lactones, lignans, peptides and depsipeptides, polyketides, quinones, sesquiterpenes, steroids, and xanthones , . A large number of cytotoxic metabolites have been produced by Penicillium sp., e.g., emodin is an anthraquinone produced by Penicillium islandicum and known as a specific inhibitor of protein tyrosine kinase p56 and protein kinase C . Penicillium oxalicum produces an eragosterol peroxide that shows selective cytotoxicity against human colon carcinoma (COLO 205) cells. There are many examples of cytotoxic compounds produced from Penicillium sp., e.g., brefeldin A, oxaline, neoxaline, vermistatin, and mycophenolic acid . In the present study, an important medicinal plant, Allium schoenoprasum L. (Alliaceae) or snow mountain garlic, was investigated for the presence of endophytic fungi. In 1965, Chopra et al. mentioned snow mountain garlic or “Kashmiri Garlic” as A. schoenoprasum. It is an important herb which grows well in the snow-covered mountains of the Western Himalayas at an altitude of 6000 feet above sea level. It has a characteristic property that it can survive in extremely cold temperatures, up to − 10 °C, with very little oxygen. Snow mountain garlic has acquired a strong reputation since ancient times regarding its health benefits. Snow mountain garlic has shown health benefits in diseases like diabetes, atherosclerosis, hypertension, and cancer , . These protective effects appear to be related to the presence of organosulfur compounds, predominantly allyl derrivatives. Considering its medicinal properties, we selected it as a host plant for endophytic isolation, as host provides nutrients to endophytes and they help the host plant to resist biotic/abiotic stress by producing a number of bioactive compounds that can be exploited for pharmacological purposes. In this study, we isolated the endophytic fungus Penicillium pinophilum from snow mountain garlic bulbs and identified it by morphological and molecular characteristics, as described in this paper. In our initial study, the ethyl acetate extract of strain MRCJ-326 showed significant cytotoxic activity against the NCI60/ATCC panel of human cancer cell lines, with the lowest IC50 value of 3.5 µg/mL for human pancreatic cancer (MIA PaCa-2) cells. During the course of the metabolite profiling of the ethyl acetate extract (LC-MS) of strain MRCJ-326, we identified a series of mono- or dimeric anthraquinones, oxyskyrin (1), skyrin (2), dicatenarin (3), and 1,6,8-trihydroxy-3-hydroxymethylanthraquinone (4) , , . The structures of these compounds were further confirmed by spectral analysis after isolation using the 2D-SEPBOX method. Purified and characterized compounds 1–4 were further studied for in vitro cytotoxic potential and apoptotic studies. Isolated endophytic fungal strain MRCJ-326 from the bulb of Allium sp. (snow mountain garlic) has shown morphological distinct characteristic features like hypha and spores of the genus Penicillium ([Fig. 1]). The corresponding ITS-rDNA sequence of the endophytic fungus ([Fig. 2]) in BlastN similarity analysis revealed 100 % sequence similarity with Penicillium pinophilum. Fig. 2 Sequencing of endophytic fungus P. pinophilum. In our initial screening, the ethyl acetate extract of P. pinophilum exhibited concentration-dependent in vitro cytotoxicity against the NCI60/ATCC panel of human cancer cell lines with the lowest IC50 value of 3.5 µg/mL against human pancreatic cancer (MIA PaCa-2) cells ([Table 1]). Further LC-MS/MS analysis of the ethyl acetate extract showed the presense of an anthraquinone class of compounds and identified a series of four compounds, oxyskyrin (1), skyrin (2), dicatenarin (3), and 1,6,8-trihydroxy-3-hydroxymethylanthraquinone (4) (Fig. 1 S, Supporting Information). These compounds were further purified for biological screening using the 2D-SEPBOX method. All of the four known compounds 1–4 ([Fig. 3]) were isolated in a single run using SEPBOX and were characterized using detailed spectroscopic analysis. Fig. 3 Structures of isolated pure compounds (1–4). Table 1 IC50 values of the extract and isolated compounds against the NC160/ATCC panel of human cancer cell lines of different tissue origin. Data are expressed as the mean ± SD. Compound 1 was obtained as an orange red powder. It showed UV absorption maxima λ max at 215, 256, 300, and 462 nm, which indicated the anthraquinone-type moiety. ESIMS data of 1 showed a base peak at m/z 554.9 [M + H]+, which inferred that 1 has an MW of 554. The molecular formula was established as C30H17O11 based on the prominent signals detected at m/z 553.2 [M – H]− in the LC-HRMS spectra. The 13 C NMR data of 1 (Table 1 S, Supporting Information) showed signals corresponding to 25 carbons. 1 H NMR showed proton signals of one aromatic methyl group resonating at δ H 2.48 p. p. m., one oxymethylene at δ H 4.87 p. p. m., one aromatic singlet at δ H 6.81 p. p.m (2 H), two aromatic broad singlets at δ H 7.26 and 7.09 p. p. m., and two aromatic doublets at δ H 7.66 and 7.51 p. p. m. The 13 C NMR data exhibited a total of 25 carbon peaks attributable to one methyl group at δ C 22.1 (CH3-11′), one oxymethylene at δ C 63.5 (CH2OH-11), five methine carbons, and eighteen quaternary carbon atoms. Detailed analysis of the 13 C spectrum disclosed signals for four carbonyl groups resonating at δ C 188.8 (C-9), 189.1 (C-9′), 181.1 (C-10), and 180.0 (C-10′), six oxygenated aromatic carbon atoms at δ C 164.3 (C-1), 163.0 (C-1′), 167.4 (C-6/6′), and 164.5 (C-8/8′), and eighteen aromatic carbons at δ C 120.8 (C-2), 126.6 (C-2′), 152.2 (C-3), 148.6 (C-3′), 120.1 (C-4), 122.0 (C-4′), 133.7 (C-4a), 132.3 (C-4a′), 124.2 (C-5/5′), 108.1 (C-7/7′), 107.2 (C-8a/8a′), 118.6 (C-9a), 115.1 (C-9a′), 133.3 (C-10a), and 132.2 (C-10a′). Further analysis of 1D together with 2D data revealed that we were dealing with a dimeric anthraquinone like emodin. Comparison of NMR data and UV spectra of 1 with those of emodin, as well as consideration of the MW, suggested that 1 is a non-symmetrical anthraquinone including one emodin and one 1,6,8-trihydroxy-3-hydroxymethylanthraquinone unit. The 1 H-1 H COSY spectrum showed that the aromatic methyl signal δ H 2.48 correlated to the meta-coupled protons H-2′ and H-4′, and an oxymethylene signal at δ H4.87 correlated to H-2 and H-4. A methyl signal at δ H 2.48 and an oxymethylene signal at δ H 4.87 also showed a strong HMBC correlation with C-2′/4′ and C-2/4, respectively. Furthermore, the linkage between these two units was confirmed at C-5/5′ by the HMBC correlations of H-7 to C-5 and H-7′ to C-5′ (Fig. 4 S, Supporting Information). From the above data, it can be concluded that the structure of oxyskyrin was previously reported from P. islandicum , . Compound 2 was obtained as a light orange red powder with UV absorption maxima identical to those of oxyskyrin (1), likewise isolated during this study. LC-HRMS exhibited a prominent peak at m/z 537.2 [M – H]− with a 16 mass unit decrease compared with the MW of 1, which established the molecular formula C30H17O10 for 2. Comparison of the 1 H NMR spectra of 2 and 1 showed a close relationship between both compounds, except for the presence of an additional methyl group and the absence of a CH2-OH group in 2. The 13 C NMR data of 2 (Table 1 S, Supporting Information) showed signals corresponding to 15 carbons only, indicating that 2 is a symmetrical dimer consisting of two identical monomers. 1 H NMR showed proton signals of one aromatic methyl group resonating at δ H 2.35 p. p. m., one aromatic singlet at δ H 6.63 p. p. m., and two aromatic broad singlets resonating at δ H 7.21 and 7.50 p. p. m. The 13 C NMR data exhibited 15 carbon peaks attributable to one methyl group, three methine carbons, and eleven quaternary carbon atoms. Further analysis of the 13 C spectrum disclosed signals for two carbonyl groups resonating at δ C 190.1 (C-9/9′) and 186.1 (C-10/10′), three oxygenated aromatic carbon atoms at δ C 162.0 (C-1/1′), 164.7 (C-6/6′), and 164.1 (C-8/8′), and nine aromatic carbons at δ C 121.4 (C-2/2′), 149.1 (C-3/3′), 123.1 (C-4/4′), 134.2 (C-4a/4a′), 125.1 (C-5/5′), 107.3 (C-7/7′), 109.1 (C-8a/8a′), 113.1 (C-9a/9a′) and δ C 131.5 (C-10a/10a′), and one methyl at 21.7 (C-11/11′). Comparison of the NMR data and UV spectra of 2, as well as consideration of the MW, suggested that 2 is a symmetrical dimer of two emodin units. The linkage between the emodin building blocks was confirmed by 2D NMR analysis, including 1 H-1 H COSY and HMBC correlations. The 1 H-1 H spectrum showed that the aromatic methyl signal correlated to the meta-coupled protons H-2 and H-4. Furthermore, in the HMBC spectrum, the aromatic proton at δ H 6.63 (H-7/7′) showed a strong correlation to a carbon resonated at δ C 125.1, which was attributed to C-5/5′ (Fig. 3 S, Supporting Information). The above data was fully comparable to the data of skyrin reported in the literature, and confirms the structure of 2 as skyrin , . Compound 3 was obtained as an orange powder and had an identical pattern in UV absorption maxima to those of 1 and 2, isolated along with this compound. LC-HRMS exhibited a prominent peak at m/z 569.3 [M – H]− with a 34 mass unit compared with the MW of 2, which established the molecular formula C30H17O12 for 3. Comparison of the 1 H NMR spectra of 3 and 2 showed a close relationship, except for the absence of one aromatic signal. Further analysis of the 1D and 2D NMR data of 3 and 2 confirmed that both share a similar skeleton and substituents, except for the additional presence of a free hydroxyl group at C-4 in 3. In analogy to 2, two isolated aromatic protons were detected in the 1 H-1 H COSY spectrum of 3. In addition, the HMBC spectrum confirmed the 13 C assignments of all of the systems in the molecules (Table 1 S, Supporting Information). In contrast to 2, the signal of a methyl group (δ H 2.21, CH3-11) in 3 exhibited a strong J 3 HMBC correlation to a carbon resonating at δ C 159.9 p. p. m., which was attributed to C-4. Hence, an additional free hydroxyl group was connected to C-4. Thus, a planar structure of 3 was accomplished and confirmed as dicatenarin. The data was fully analogous to the data of dicatenarin reported in the literature . Compound 4 was obtained as a yellow-orange needle with an m. p. between 285–290 °C and UV absorption maxima quite similar to those of 1–3. LC-HRMS exhibited a prominent peak at m/z 285.3 [M – H]− corresponding to the molecular formula C15H9O6. The 13 C NMR (Table 1 S, Supporting Information) spectrum of 4 showed a close relationship with 1. Further analysis of the 1D and 2D NMR data of 4 confirmed that it has the same skeleton and substituents as 1; however, it is a monomer, as revealed from the molecular formula. A careful literature search revealed that 4 is a well-known 1,6,8-trihydroxy-3-hydroxymethylanthraquinone previously isolated from Penicillium janthinellum . Of the four isolated compounds from the ethyl acetate extract, two, dicatenarin and skyrin, showed significant cytotoxicity with least IC50 values of 12 and 27 µg/mL, respectively, against human pancreatic cancer (MIA PaCa-2) cells. However, in oxyskyrin and 1,6,8-trihydroxy-3-hydroxymethylanthraquinone, a significant cytotoxic effect was not observed ([Table 1]). Induction of apoptosis in MIA PaCa-2 cells was investigated by microscopic analysis of the DAPI-stained cells ([Fig. 4]). After 48 h of treatment, dicatenarin- and skyrin-treated MIA PaCa-2 cells demonstrated significant chromatin condensation and fragmentation within the nucleus in a concentration-dependent manner. However, chromatin condensation and fragmentation was more prominent in dicatenarin- compared to skyrin-treated cells. In paclitaxel-treated MIA PaCa-2 cells, significant chromatin condensation was observed, and no chromatin condensation was observed in untreated controls. To determine the extent of apoptosis of dicatenarin- and skyrin-induced cell death in MIA PaCa-2 cells, the annexin V-FITC and PI dual staining was determined by laser scanning confocal microscopy. The data showed that untreated cells were negative for annexin V-FITC and PI staining, whereas positive cells were seen following both dicatenarin and skyrin treatment. The data also revealed that a significant amount of annexin v positive cells were seen in the case of dicatenarin, more than in skyrin, in the treated cells ([Fig. 5]). We determined ROS generation is induced by dicatenarin and skyrin in MIA PaCa-2 cells. Both dicatenarin and skyrin increased ROS generation in a concentration-dependent manner after 48 h treatment, but the phenomenon of ROS generation was much higher in dicatenarin-treated cells compared to skyrin. In H2O2-treated (0.05 %) MIA PaCa-2 cells, prominent ROS generation was observed, whereas in the untreated control, no ROS generation was observed ([Fig. 6]). Loss of MTP (Δψm) in MIA PaCa-2 cells was measured with a laser scanning confocal microscope. MTP loss has been seen considerably in MIA PaCa-2 cells when exposed to different concentrations of dicatenarin and skyrin after 48 h treatment as compared to untreated cells. Moreover, dicatenarin treatment induced significant MTP loss compared to skyrin. In paclitaxel-treated (1 µg/mL) MIA PaCa-2 cells, prominent MTP loss was observed ([Fig. 7]). We further carried out immunofluorescence microscopic studies to determine the cytochrome c release from the mitochondria into the cytosol in MIA PaCa-2 cells during apoptosis. The distribution of cytochrome c was visualized by immunostaining the cells with anti-cytochrome c antibody. The localization of the mitochondria was revealed by staining the cells with MitoTracker Red. As we compared the distribution pattern of the endogenous cytochrome c and the morphological pattern of mitochondria, we found a prominent release of cytochrome c from the mitochondria in dicatenarin-treated MIA PaCa-2 cells, whereas skyrin-treated MIA PaCa-2 cells showed a mild cytochrome c release at higher concentrations after 48 h treatment. In doxorubicin (0.5 µg/mL), the release of cytochrome c was very prominent ([Fig. 8]). We confirmed the participation of activated caspase-3 in the events of apoptosis in MIA PaCa-2 cells induced by dicatenarin and skyrin after 48 h treatment. Caspase-3 activity was shown to be significantly elevated in dicatenarin-treated MIA PaCa-2 cells in a concentration-dependent manner ([Fig. 9]). However, in comparison to dicatenarin, there was the least increament in caspase-3 activity in skyrin-treated MIA PaCa-2 cells, even at a higher concentration. In staurosporine-treated (0.5 µg/mL) MIA PaCa-2 cells, significant caspase-3 activity was observed. The clonogenic assay revealed that both dicatenarin and skyrin treatment significantly induced a reduction in the colony formation ability of MIA PaCa-2 cells. 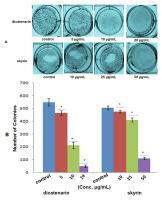 However, the reduction was less observed in skyrin-treated cells compared to dicatenarin treatment. In untreated MIA PaCa-2 cells, overlapping colonies were observed, whereas no overlapping cells were observed following treatment of both of the compounds ([Fig. 10]). Endophytic fungi have been a promising source for bioactive compounds, especially their anticancer potential. As great demand arises for new drug leads for cancer, there arises a need to exploit the endophytic fungi associated with medicinal plants. In the present study, we collected A. schoenoprasum bulbs from snow mountain regions of the Western Himalayas for the isolation of endophytic fungi. In 1965, Chopra et al. reported an enhancement of seven times in the medicinal properties of the garlic species growing at higher elevations due to a high content of organosulphur compounds . It is also known to have abundant biological activities including immunomodulatory and anticancer properties . The endosymbiotic nature of many endophytic fungi is to inherit their bioactive secondary metabolite-producing capability from their host. Considering this a major reason, we selected it as a host plant ,  and isolated the endophytic fungus P. pinophilum (MRCJ-326) growing from its bulbs. Endophytic fungal research is focussed on Penicillium sp. for its secondary metabolites displaying various pharmacological effects including anticancer activity . Previously, it has been reported that a multitude of anticancer agents have been produced from Penicillium sp., e.g., brefeldin A, wortmanin, and chloctanspirone A . In the present study, the crude ethyl acetate extract of the endophytic fungus P. pinophilum has been evaluated for in vitro cytotoxicity (% growth inhibition) against the NCI60/ATCC panel of human cancer cell lines of different tissue origin; A549 (lung), MIA PaCa-2 (pancreatic), HCT-116 (colon), T47D (breast), PC3 (prostate), OVCAR-3 (ovarian). This study highlighted the crude ethyl acetate extract of P. pinophilum as a persuasive resource of natural cytotoxic agents. 2D SEPBOX fractionation/purification of the cytotoxically active ethyl acetate extract yielded a series of anthraquinones including monomeric/dimeric trihydroxyanthraquinones, i.e., oxyskyrin, skyrin, dicatenarin, and 1,6,8-trihydroxy-3-hydroxymethylanthraquinone. This is the first report from the P. pinophilum species producing these anthraquinones. Earlier reports have shown that P. pinophilum has produced a secondary metabolite, 3-O-methylfunicone, which showed apoptotic potential on human breast cancer (MCF-7) cells . 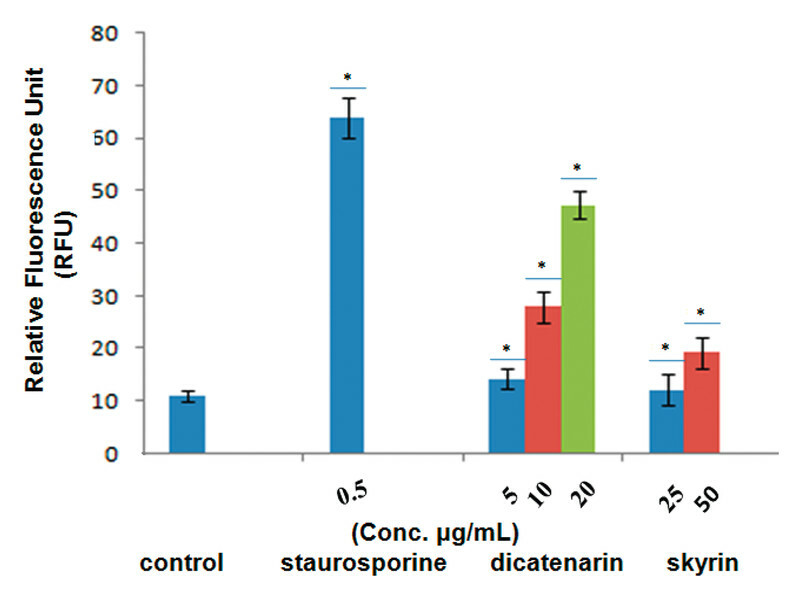 In vitro cytotoxic (% growth inhibition) evaluation data against the NCI60/ATCC panel of human cancer cell lines of different tissue origin revealed that among all of the isolated compounds, dicatenarin and skyrin demonstrated promising cytotoxic potential with the lowest IC50 values of 12 µg/mL and 27 µg/mL, respectively, against human pancreatic cancer (MIA PaCa-2) cells. Skyrin was reported earlier as a glucagon antagonist and isolated previously from both lichens Lasallia and Trypetheliopsis boninensis and fungi including P. islandicum, Penicillium rugulosum, and Penicillium funiculosum . 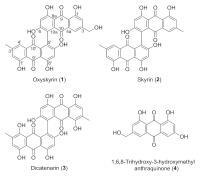 Skyrin has also been isolated from the genus Talaromyces (Penicillium) and the species Wortmannii, which has also produced other steroid metabolites, i.e., wortmannin, which is a specific inhibitor of phosphoinositide 3-kinases and related enzymes such as mTOR, DNA-PK, and mitogen-activated protein kinase at high concentrations. 1,6,8-Trihydroxy-3-hydroxymethylanthraquinone has been reported for antibacterial, i.e., leishmanicidal, activity . Dicatenarin has never been explored for any pharmacological activities. We are reporting, for first time, its significant cytotoxic potential against human pancreatic cancer. 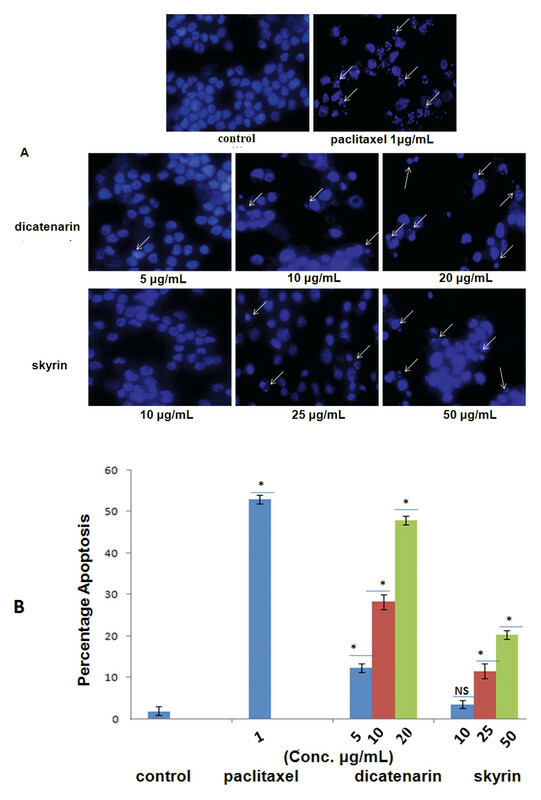 To examine whether dicatenarin and skyrin were merely killing the cells through cytotoxic action or by inducing apoptosis, we analyzed the human pancreatic cancer (MIA PaCa-2) cells for change in preliminary morphological characteristics typical for apoptosis upon treatment with test materials by staining the nuclei with DAPI. 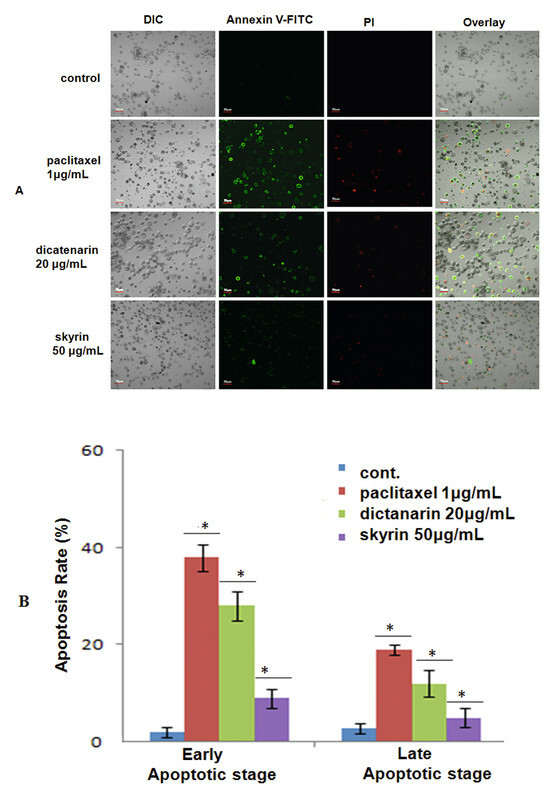 Dicatenarin induced pronounced chromatin condensation and fragmentation of the nuclei of the cells in a concentration-dependent manner, whereas the effect was not pronounced much in skyrin-treated cells. Annexin V/PI dual staining suggested that in the event of early cell death, phosphatidylserine externalization was more significant in dicatenarin-treated cells compared to skyrin. To gain insight into the mechanism by which dicatenarin and skyrin results in cell death, we next examined ROS production, since the excessive generation of ROS results in cell injury and death . 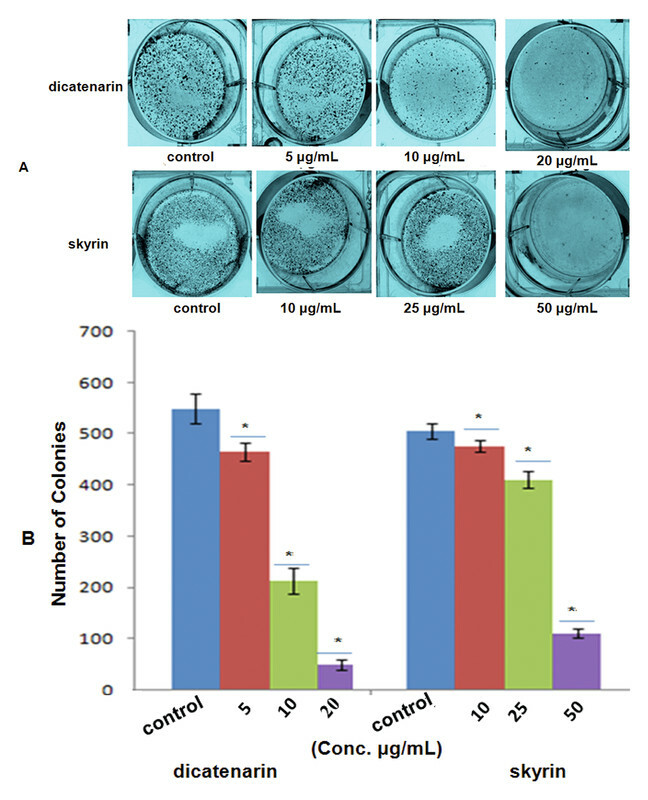 Both dicatenarin and skyrin increased ROS/oxidative stress in MIA PaCa-2 cells in a concentration-dependent manner, but the phenomenon was much higher in the case of dicatenarin. Mitochondria play an important role in energy production and are also important sensors for apoptosis. Mitochondria-mediated ROS generation is a major source of oxidative stress in the cell . We measured changes in MTP with a laser scanning confocal microscope, which revealed a considerable loss of MTP in human pancreatic cancer (MIA PaCa-2) cells treated with different concentrations of both dicatenarin and skyrin. Mitochondria manages apoptotic signals that not only include the generation of ROS and loss of MTP, but also the release of cytochrome c, which recruits effector caspases leading to programmed cell death. For further analysis of the apoptotic pathway, the release of cytochrome c and the induction of caspase(s) was studied. Our immunofluorescence data revealed colocalization between mitochondria and cytochrome c. Cytochrome c was found to be highly colocalized with mitochondria in the untreated control cells. In contrast, MIA PaCa-2 cells exposed to dicatenarin and doxorubicin (positive control) treatment exhibited diffused cytoplasmic distribution of cytochrome c from the transition pores of the mitochondria into the cytosol, whereas skyrin-treated human pancreatic cancer (MIA PaCa-2) cells showed mild cytochrome c release at a higher concentration. Since it is a key event in initiating the caspase cascade involving caspase-3, we confirmed the participation of activated caspase-3 in the events of apoptosis induced by dicatenarin and skyrin. Caspase-3 acivity was significantly elevated in dicatenarin-treated human pancreatic cancer cells (MIA PaCa-2). Comparatively, there is the least increament in caspase-3 activity in skyrin-treated MIA PaCa-2 cells after 48 h treatment. To assess the effect of the test material(s) on proliferation, growth, survival, and colongenic ability, human pancreatic cancer (MIA PaCa-2) cells were treated with different concentrations of test material(s) for colony formation. Both of the compounds produced a concentration-dependent inhibitory effect on the ability of the cells to reproduce and form large colonies. The untreated control showed overlapping colonies, whereas no overlapping was observed in both of the compounds. Considering the true pharmacological potential of isolated and well-characterized secondary metabolites, i.e., dicatenarin (3) and skyrin (2) of P. pinophilum isolated from the bulb of snow mountain garlic (Allium sp. ), further studies are required to mechanistically evaluate and optimize the identified leads for cancer. In conclusion, we have isolated and characterized four compounds (1–4) from the endophytic fungus P. pinophilum (MRCJ-326) associated with the bulbs of A. schoenoprasum. All of the isolated compounds were tested against a panel of human cancer cell lines. As shown in [Table 1], two compounds, dicatenarin (3) and skyrin (2), exhibited marked cytotoxic and proapoptotic potential, while compounds 1 and 4 were found inactive against the tested cell lines. Our results indicate that dicatenarin induced apoptosis through an apoptotic signal via intracellular ROS generation, and thereby a loss of MTP, and the induction of the mitochondrial-mediated apoptotic pathway. Cytochrome c release from the mitochondrial transition pore further resulted in an increased expression of apoptotic effector protein caspase-3 for the execution of programmed cell death. In compounds 1 and 4, the methyl group at the C-3 position was oxidized to primary alcohol and converted into CH2OH, which leads to the complete loss of its activity. These results also suggested that in 1,6,8-trihydroxy anthraquinone, the C-3 methyl group played a significant role in the cytotoxic potential as in skyrin and dicatenarin. Based on the bioactivity potential of these compounds, they can be studied further mechanistically and optimized for development as anticancer leads. Cetyltrimethylammonium bromide, deuterated solvents, and CD3OD used in this study were obtained from Sigma-Aldrich. 1 H, 13 C, and 2D-NMR spectra were recorded on 400 MHz instruments (Bruker). The chemical data for the protons was reported in parts per million (p. p. m.) downfield from tetramethylsilane and are referenced to the residual proton in the NMR solvent (CD3OD: 3.31 ppm). ESIMS were recorded on an Agilent 1100 LC-QTOF mass spectrometer. HPLC grade solvents like ACN and MeOH used for 2D-HPLC were purchased from SD Fine Chemical Limited. Water used for extractions was obtained from a Milli-Q Advantage A10 high-purity water system (Millipore). PDA, 1 % sodium hypochlorite, lactophenol-cotton-blue, 15 % glycerol, were purchased from Difco. The DNA purification kit was purchased from Qiagen. The caspase activity kit was purchased from Cell Signaling Technology. Dulbeccoʼs modified Eagleʼs medium, Rosewell Park Memorial Institute medium (RPMI-1640), fetal bovine serum (10 %), rhodamine 123 (Rh 123), DAPI (Dilactate), DMSO, gentamycin sulphate, trypsin, EDTA, PBS penicillin, streptomycin, paclitaxel (purity > 95 % by HPLC), mitomycin (purity > 95 % by HPLC), doxorubicin (purity > 98 % by HPLC), gemcitabine (purity > 98 % by HPLC), staurosporine (purity > 95 % by HPLC), and all other chemicals were purchased from Sigma-Aldrich. Tris buffer was procured from Himedia. Glacial acetic acid was purchased from Fisher Scientific and trichloroacetic acid was from Merck Specialties Private Ltd. The human lung cancer cell line (A549), human colon cancer cell line (HCT-116), human breast cancer cell line (T47D), human prostate cancer cell line (PC3), and human ovarian cancer cell line (OVCAR-3) were obtained from the National Cancer Institute (NCI). The human pancreatic cancer cell line (MIA PaCa-2) was obtained from American Type Culture Collection (ATCC). The human pancreatic cancer cell line (MIA PaCa-2) and human colon cancer cell line (HCT-116) were maintained in Dulbeccoʼs modified Eagleʼs medium. The human lung cancer cell line (A549), human breast cancer cell line (T47D), human prostate cancer cell line (PC3), and human ovarian cancer cell line (OVCAR-3) were maintained in RPMI. The media was supplemented with fetal bovine serum (10 %), penicillin (100 units/mL), streptomycin (100 µg/mL), and glutamine (2 mM). Cells were grown in CO2 (Thermo Scientific incubator) at 37 °C with 98 % humidity and 5 % CO2. The concentration of DMSO added to the test materials was maintained at < 0.2 %. Plant samples, i.e., bulbs of A. schoenoprasum, were collected from the Western Himalayas from the snow mountain regions of Nattha top, J&K, India. Samples were tagged, transported to the laboratory in sterile plastic bags, and stored at 4 °C until processed for isolation of the endophytic fungi. Samples were identified taxonomically by Dr. Sumeet Gairola, the Herbarium and Plant Sytematics Section, Plant Biotechnology Division, CSIR-IIIM, and given Crude Drug Repository Accession Number (CDR) 4029. Isolation of the endophytic fungi was carried out based on the procedures described earlier by Erza et al. . The bulb samples were washed thoroughly with tap water to remove soil particles, sectioned into small pieces of 2–3 cm, and surface sterilized with 1 % sodium hypochlorite, followed by a rinse with sterile distilled water to remove traces of sodium hypochlorite and 90 % ethanol. The outer tissues of the bulb samples were removed under sterile laminar air flow. Small sections of 0.5 to 1 cm were plated on the culture media, such as PDA and water agar, after passing through a flame. The plates were incubated at 25 °C for 3 weeks. Hyphal tips of fungi, emerging out of the plant bulb samples, were picked and grown on a PDA plate until pure cultures were obtained. The cultures were stored in 15 % glycerol and stored at − 70 °C. The isolated cultures were also submitted to the IIIM repository (IIIM Microbial repository No. MRCJ-326) for lyophilization and preservation. Identification and characterization of the MRCJ-326 isolate was carried out by using morphological and molecular procedures. The morphological examination was performed by observing the microscopic characteristics of the fungal culture on PDA. Microscopic slides were prepared by staining with lactophenol cotton blue  and were examined under a light microscope (Olympus). Total genomic DNA of the fungal isolate was extracted according to Ausubel et al. using CTAB (cetyltrimethylammonium bromide) as per the manufacturerʼs protocol. Fungal identification methods were based on their ITS of the fungal ribosomal DNA (ITS1–5.8 S-ITS2), and were amplified using universal primers ITS4 (5′TCCTCCGCTTATTGATATGC3′) and ITS5 (5′GGAAGTAAAAGTCGTAACAA3′). The thermal cycling program used was as follows: 3 min initial denaturation at 94 °C, followed by 30 cycles of 15 sec denaturation at 94 °C, 30 sec primer annealing at 55 °C, 45 sec extension at 72 °C, and a final 7-min extension at 72 °C. The PCR amplified products were visualized on 1 % (w/v) agarose gel. The amplicons were purified by using a DNA purification kit (Qiagen) and the purified product was used for sequencing the DNA. The corresponding ITS-rDNA sequence of the endophytic fungus was then used for similarity analysis using a BlastN algorithm against the public database at the National Center for Biotechnology Information (NCBI; http://www.ncbi.nlm.nih.gov). The endophytic fungal isolate P. pinophilum (MRCJ-326) was cultured in 25 L of potato dextrose broth for 10 days at 25 °C and 180 rev/min. The fermentation culture was then filtered using muslin cloth. The filtrate was extracted with ethyl acetate (10 L, 16 h) successively five times. The extract was evaporated separately to dryness using rotavapor at 30 °C. LC-MS is the preferred technique for the separation and detection of the large and often unique group of semi-polar secondary metabolites in natural product extracts. Specifically, LC-MS enables the detection of large numbers of parent ions present in a single extract and provides valuable information on the chemical composition and thus the putative identity of large numbers of metabolites. In our study, the ethyl acetate extract was analyzed using LC-MS (Agilent), a reversed-phase C18 (RP-C18) HPLC equipped with a photodiode array detector and triple quadrupole MS. The first 0–15 min of the run was a gradient from 10–50 % aqueous (0.1 % formic acid) ACN to 75 % ACN in the next 10 min, followed by a 75 % aqueous (0.1 % formic acid) ACN wash for 5 min to complete a total run of 30 min. A flow rate of 0.45 mL/min was employed. The column utilized during this experiment was a Merck Chromolith RP 18e, 50 × 4.6 mm, 5 µm pore size ([Fig. 3]). SEPBOX is based on a combination of HPLC and solid-phase extraction. One of its types, 2D-SEPBOX, can detect almost all substances by using two detection systems [ultraviolet (UV) detection and an optional evaporative light scattering detection, ELSD]. This purification was performed for the ethyl acetate extract. The extract (150 mg) was dissolved in methanol (15 mL), membrane filtered, and then mixed with sorbent C4 silica (10 g, sepiatec, 360–200 mesh). The mixture was dried under vacuum to remove the residual solvent, thus yielding a free-flowing powder. The sample was then loaded onto a stainless steel column (8 mm D × 60 mm L), leaving one side open and 1 g of blank C4 silica material (1.0 g) was added. After levelling the surface of the stationary phase, the adsorbed extract was funnelled onto the top of the stationary phase, the surface was levelled, the remaining volume of the injection column was filled with blank C4 silica material, the column end fitting was attached, and then the injection column was connected to the SEPBOX 2D-250-HPLC system (Sepiatec). Using HPLC grade water as solvent A and methanol as solvent B, the effluent of the injection column was continuously pumped onto a 150 × 16 mm, i. d., 5 µm, VP150/16 Nucleoprep 100–12 C4 end-capped column at a flow rate of 4.5 mL/min. Chromatography was performed with the following gradient: 0 min, 20 % B; 10 min, 50 % B; 20 min, 100 % B; 30 min, 100 % B; 31 min, 20 % B; 37 min, 20 % B. Concomitant with the separation, a flow gradient was run with water, which was mixed with the C4 column effluent using the following flow rates: 0 min, 0 mL/min; 1 min, 50 mL/min; 12 min, 25 mL/min; 16 min, 20 mL/min; 21 min, 20 mL/min; 24 min, 1 mL/min. The effluent was collected in 16 subfractions, namely EA/1-EA/16, which were trapped onto VP30/32 Nucleoprep 100–12 C4 end-capped solid-phase extraction columns preconditioned with water (10 min, 8 mL/min) prior to the separation. Each subfraction was further separated on a 250 × 10 mm, 5 µm, Luna Phenyl-Hexyl column (Phenomenex) using the following gradient of water (solvent A), methanol (solvent B), and ACN (solvent C) at a flow rate of 4.5 mL/min: fraction EA/1, 0 min, A/B/C (100 : 0 : 0), 60 min, A/B/C (100 : 0 : 0), 65 min, A/B/C (90 : 0 : 10), 72 min, A/B/C (0 : 50 : 50); fraction EA/2, 0 min, 38 % B, 29 min, 58 % B, 30 min, 100 % B, 34 min, 100 % B; fraction EA/3, 0 min, A/B/C (56 : 44 : 0), 29 min, A/B/C (37 : 63 : 0), 30 min, A/B/C (0 : 100 : 0), 34 min, A/B/C (0 : 100 : 0); fraction EA/4, 0 min, A/B/C (48 : 52 : 0), 29 min, A/B/C (23 : 67 : 0), 30 min, A/B/C (0 : 100 : 0), 34 min, A/B/C (0 : 100 : 0); fraction EA/5, 0 min, A/B/C (32 : 68 : 0), 29 min, A/B/C (28 : 72 : 0), 30 min, A/B/C (0 : 100 : 0), 34 min, A/B/C (0 : 100 : 0); fraction EA/6, 0 min, A/B/C (31 : 69 : 0), 29 min, A/B/C (20 : 80 : 0), 30 min, A/B/C (0 : 100 : 0), 34 min, A/B/C (0 : 100 : 0); fraction EA/7, 0 min, A/B/C (22 : 78 : 0), 29 min, A/B/C (13 : 87 : 0), 30 min, A/B/C (0 : 100 : 0), 34 min, A/B/C (0 : 100 : 0); fraction EA/8, 0 min, A/B/C (22 : 78 : 0), 29 min, A/B/C (9 : 91 : 0), 30 min, A/B/C (0 : 100 : 0), 34 min, A/B/C (0 : 100 : 0); fraction EA/9, 0 min, A/B/C (21 : 79 : 0), 29 min, A/B/C (9 : 91 : 0), 30 min, A/B/C (0 : 100 : 0), 34 min, A/B/C (0 : 100 : 0); fraction EA/10, 0 min, A/B/C (22 : 88 : 0), 29 min, A/B/C (7 : 93 : 0), 30 min, A/B/C (0 : 100 : 0), 34 min, A/B/C (0 : 100 : 0); fraction EA/11, 0 min, A/B/C (7 : 93 : 0), 29 min, A/B/C (5 : 95 : 0), 30 min, A/B/C (0 : 100 : 0), 34 min, A/B/C (0 : 100 : 0); fraction EA/12, 0 min, A/B/C (3 : 97 : 0), 16 min, A/B/C (3 : 97 : 0), 17 min, A/B/C (0 : 100 : 0), 29 min, A/B/C (0 : 93 : 7), 30 min, A/B/C (0 : 50 : 50), 34 min, A/B/C (0 : 50 : 50); fraction EA/13, 0 min, A/B/C (3 : 97 : 0), 16 min, A/B/C (3 : 97 : 0), 17 min, A/B/C (0 : 100 : 0), 29 min, A/B/C (0 : 93 : 7), 30 min, A/B/C (50 : 50 : 0), 34 min, A/B/C (0 : 50 : 50); fraction EA/14, 0 min, A/B/C (0 : 98 : 2), 29 min, A/B/C (0 : 89 : 11), 30 min, A/B/C (0 : 50 : 50), 34 min, A/B/C (0 : 50 : 50); fraction EA/15, 0 min, A/B/C (0 : 98 : 2), 29 min, A/B/C (0 : 80 : 20), 30 min, A/B/C (0 : 50 : 50), 34 min, A/B/C (0 : 50 : 50); fraction EA/16, 0 min, A/B/C (0 : 100 : 0), 29 min, A/B/C (0 : 34 : 66), 30 min, A/B/C (0 : 10 : 90), 34 min, A/B/C (0 : 10 : 90). Column equilibration for each separation was 10 min at the initial gradient conditions. Each subfraction, EA/1–16, was separated/collected into subfractions in 48-well plates (4 mL/well) based on its purity. Well numbers 7, 8, 11, and 44 contained the compounds dicatenarin (3), oxyskyrin (1), skyrin (2), and 1,6,8-trihydroxy-3-hydroxymethylanthraquinone (4) sequentially. Compounds from these wells were first collected and dried under vacuum for further NMR and MS spectroscopic analysis. Oxyskyrin (1): Orange-red amorphous solid; m. p. > 361 °C; UV λ max/nm (MeOH): 215, 256, 300, and 462; 1 H NMR (400 MHz, methanol-d 4): δ H 2.48 (3 H, brs, CH3-11′), δ H 4.87 (2 H, s, CH2-11), δ H 7.26 (1 H, brs, H-2), δ H 7.09 (1 H, brs, H-2′), δ H 6.81 (2 H, s, H-7,7′), δ H 7.66 (1 H, d, J = 2.6 Hz, H-4), 7.51 (1 H, d, J = 2.6 Hz, H-4′), ESIMS: m/z 554.9, LC-HRMS (full scan) calcd. for C30H17O11 [M – H]− m/z 553.2 (100 %) , . Skyrin (2): Orange red powder; m. p. > 300 °C; UV λ max/nm (MeOH): 212, 256, 302, and 459; 1 H NMR (400 MHz, methanol-d 4): δ H 2.35 (6 H, brs, CH3-11,11′), δ H 7.21 (2 H, brs, H-2,2′), δ H 6.63 (2 H, ssss, H-7,7′), δ H 7.50 (2 H, brs, H-4,4′); LC-HRMS (full scan) calcd. for C30H17O10 [M – H]− m/z 537.2 (100 %) , . Dicatenarin (3):Orange amorphous powder, m. p. > 320 °C; UV λ max/nm (MeOH): 212, 265, 307, and 465; 1 H NMR (400 MHz, methanol-d 4): δ H 2.21 (6 H, brs, CH3-11,11′), δ H 7.25, (brs, 2 H-2,2′), δ H 6.60 (brs, 2 H, H-7,7′); LC-HRMS (full scan) calcd. for C30H17O12 [M – H]− m/z 569.2 (100 %) . 1,6,8-trihydroxy-3-hydroxymethylanthraquinone (4): Yellow-orange needles; m. p. 285–290 °C; UV λ max/nm (CH2Cl2): 232, 260, 308, and 372 1 H NMR (400 MHz, methanol-d 4): δ H 4.76 (2 H, s, CH2-11), δ H 6.75 (1 H, d, J = 2.1 Hz, H-7), δ H 7.20 (1 H, d, J = 2.1 Hz, H-5), δ H 7.25 (1 H, brs, H-2), δ H 7.69 (1 H, brs, H-4); LC-HRMS (full scan) calcd. for C15H09O6 [M – H]− m/z 285.3 (100 %) . Potential cell cytotoxicity of the crude ethyl acetate extract and isolated compounds were evaluated against a panel of human cancer cell lines. Test materials (extract and isolated compounds) were dissolved in DMSO and serially diluted at different concentrations (1, 10, 30, 50, 100 µg/mL). Human cancer cell lines were seeded in 96-well plates at a cell density of 104 cells/well for 24 h before treatment with the test material to allow the attachment of the cell to the plate. Serially diluted test materials were added to the cells in triplicate after being prepared for each individual concentration and were further incubated with the compound for 48 h at 37 °C in atmosphere of 5 % CO2. After 48 h, the cells were fixed with chilled 50 % trichloroacetic acid, dried, and stained with sulphorhodamine B dye. The excess dye was washed with 1 % glacial acetic acid and the remaining cell bound dye was dissolved in Tris EDTA buffer and colorimetrically measured at 540 nm in a Biotek ELISA reader , . The presence of apoptotic cells were determined by staining MIA PaCa-2 cells with DAPI. Human pancreatic cancer (MIA PaCa-2) cells (2 × 105/mL/well) were seeded in 60 mm culture dishes. After 24 h, the cells were incubated with different concentrations of dicatenarin (5, 10, 20 µg/mL), skyrin (10, 25, 50 µg/mL), and paclitaxel (1 µg/mL) for 48 h. The media was collected and the cells were rinsed with PBS, detached by trypsinization, and added back to the conditioned media to ensure that floating and poorly attached cells were included in the analysis. Air-dried smears of MIA PaCa-2 cells were fixed in methanol at − 20 °C for 20 min, air-dried, and stained with DAPI at 1 µg/mL in PBS at room temperature for 20 min in the dark and the slides were mounted in glycerol-PBS (1 : 1) and examined with an inverted fluorescence microscope (Olympus, 1X81) . Annexin V-FITC and PI dual staining is usually used to detect the early and late apoptotic cells. For measuring apoptosis, human pancreatic cancer (MIA PaCa-2) cells were seeded in 6-well plates (2 × 105 cells/mL/well) and treated with dicatenarin (20 µg/mL) and skyrin (50 µg/mL) for 48 h. Paclitaxel (1 μg/mL) was used as a positive control. After 48 h treatment, the cells were collected, washed twice with PBS, and resuspended in binding buffer. There after, the cells were stained with annexin V/FITC and PI for 15 min in the dark and analyzed by a laser scanning confocal microscope (Olympus Fluoview FV 1000) . 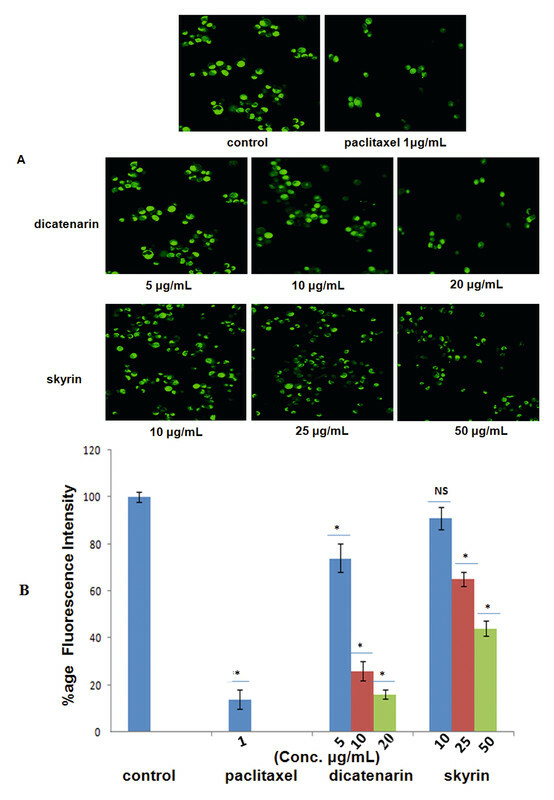 Intracellular ROS levels were monitored by fluorescence microscopy after staining with DCFH-DA. Human pancreatic cancer (MIA PaCa-2) cells (2 × 105/mL/well) were seeded in 60 mm culture dishes. After 24 h, the cells were incubated with different concentrations of dicatenarin (5, 10, 20 µg/mL) and skyrin (25, 50 µg/mL) for 48 h. H2O2 (0.05 %) was used as a positive control. Following treatment, the medium was removed and the cells were loaded with 5 µM DCFH-DA diluted in incomplete medium for 30 min at 37 °C. The cells were washed three times with incomplete medium and were observed by a laser scanning confocal microscope at 10× . Loss in MTP (Δψm) as a result of mitochondrial perturbation was studied using confocal microscopy after staining with rhodamine 123 (Rh123). Human pancreatic cancer (MIA PaCa-2) cells (2 × 105/mL/well) were seeded in 6-well plates and treated with different concentrations of dicatenarin (5, 10, 20 µg/mL), skyrin (10, 25, 50 µg/mL), and paclitaxel (1 µg/mL) for 48 h. The cells were trypsinized and washed twice with PBS. The cell pellets were then suspended in 2 ml fresh medium containing Rh123 (1.0 µM) and incubated at 37 °C for 20 min with gentle shaking. The cells were collected by centrifugation and washed twice with PBS, then analyzed by a laser scanning confocal microscope (Olympus Fluoview FV1000) . The status of cytochrome c (intact or released) was examined by immunofluorescence microscopy. After 48 h treatment with dicatenarin (5, 10, 20 µg/mL), skyrin (25, 50 µg/mL), paclitaxel (1 µg/mL), and doxorubicin (0.5 µg/mL), human pancreatic cancer (MIA PaCa-2) cells (2 × 105/mL/well) were processed for immunofluorescence microscopic studies for the detection of cytochrome c release. The cells were incubated with MitoTracker Red (100 nm) for 10 min in the dark. Then cells were fixed in 4 % paraformaldehyde for 10 min at room temperature and permeabilized using 0.5 % Triton-X in PBS for 5 min. The cells were blocked with 10 % goat serum for 20 min at room temperature. The expression of cytochrome c proteins was detected by incubating the cells with specific primary antibody anti-cytochrome c (mouse) for 1 h at room temperature (dilution 1 : 100). The Alexa Fluor 488 conjugated secondary antibody was diluted 1 : 500 in PBS and incubated for 1 h at room temperature. The cells were then washed three times in PBS and stained with DAPI (1 µg/mL in PBS). The coverslips were mounted over glass slides and the cells were imaged by a laser scanning confocal microscope (Olympus, Fluoview FV 1000) at 40× with an oil immersion lens , . Caspase-3 activity was determined using a commercial kit (Cell Signaling Technology) according to the manufacturerʼs instructions. Human pancreatic cancer (MIA PaCa-2) cells (2 × 105/mL/well) were seeded in 6-well plates and treated with dicatenarin (5, 10, 20 µg/mL), skyrin (25, 50 µg/mL), and staurosporine (0.5 µg/mL) for 48 h following the same treatment as above. After treatment, the cells were harvested by centrifugation and the pellets were washed with PBS before lysis in chilled lysis buffer. The mixture was left on ice for 10 min and then centrifuged at 14 000 g (Eppendorf Centrifuge, Sigma) at 4 °C for 10 min. The resulting supernatant was used for the determination of caspase activities. There results were read on a microplate reader at 405 nm . A clonogenic assay was performed to determine the capability of a cell to grow into a colony. Human pancreatic cancer (MIA PaCa-2) cells were plated at a seeding density of 1 × 103 cells/mL/well in 6-well plates. After 24 h, the culture medium was changed and new medium was added, and the cells were exposed to different concentrations of dicatenarin (5, 10, 20 µg/mL) and skyrin (10, 25, 50 µg/mL) for 7 days in a 37 °C incubator in 5 % CO2. Later on, the obtained colonies were fixed with 4 % paraformaldehyde and were stained with 0.5 % crystal violet solution , . The colonies from the plates were counted and photographed. Results are expressed as mean ± of SD of three individual experiments. Standard deviations were calculated using Graphpad prism and Microsoft excel. P values < 0.05 were considered significant. 13 C-NMR data of compounds 1–4 in CD3OD, LC-MS dereplication data of the ethyl acetate extract, and key 1 H-13 C HMBC spectra of 1 and 2 are available as Supporting Information. We sincerely thank Dr. Sumeet Gairola, Scientist, Herbarium and Plant Sytematics Section Plant Biotechnology Division, CSIR-IIIM, Jammu, for identification of the plant material. We also thank DST, Government of India for financial support in the form of the DST-inspire award and fellowship to Mytre Koul and Ashok Kumar and UGC for RGNF to Samdarshi Meena.